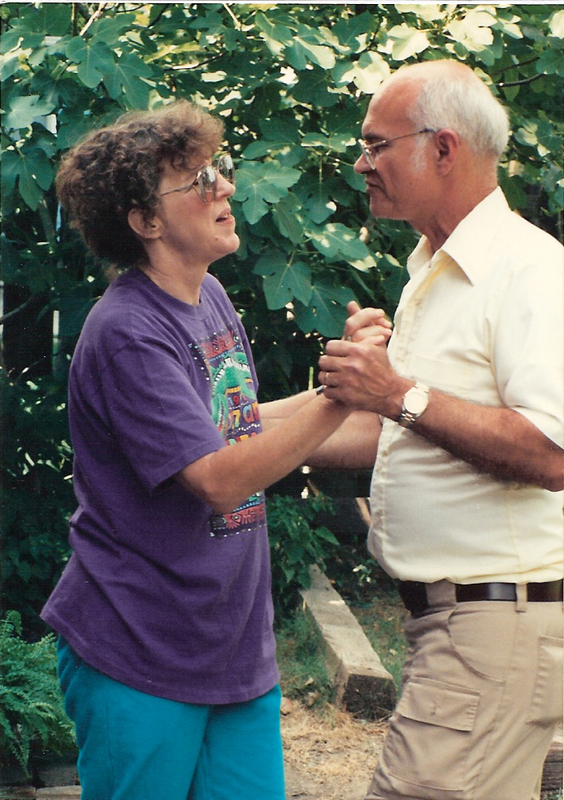 This is my mom and dad Cajun dancing at a crawfish boil we threw in our back yard many years ago, with the huge fig tree in the background. Circa 1992. The last time I canned anything was about fourteen years ago when we had two huge fig trees in our back yard in New Orleans. About this time of year and for two to three weeks between the end of June and the first few weeks of July, we would have figs coming out of our ears. The children would help pick too and we would have gallon sized plastic zip bags full of the ripe figs sitting on our fridge shelves, and giving away most of them before they went bad. On Several occasions, we would make fig preserves with mostly a lot of sugar, and some orange peel along with the whole figs, cooking them down into a thick jam-like consistency, and then put them up in half-pint jars. They lasted years and were just as good as the first batch. No more fig trees, but we now have an abundance of tiny grape tomatoes, the “Sweet 100” variety to be exact, along with plenty of cucumbers in our garden this year. So, finally found a great way to put up the diminutive tomato morsels with a pickling recipe from the Ball Blue Book guide to preserving, the 100th Anniversary Edition which was printed in 2009. In addition, since the book is used as a guideline I modified the recipe to suite my tastes and used only ½ the amount of white wine vinegar, replaced the other ½ using cider vinegar and in place of the white vinegar, and doubled the amount of garlic in the recipe. The next time I process the pickled grape tomatoes, I may add some form of fresh peppers to help add a hotter flavor profile. This recipe will yield about six 1-pint jars of pickled grape tomatoes. 1. Wash the grape tomatoes and drain them to dry. 2. Combine the salt, white wine vinegar, cider vinegar, water, and whole garlic in a medium saucepan and bring to a boil, then simmer for 10 minutes. 3. Prick the grape tomatoes with a paring knife to help prevent them from splitting or cracking. Then pack the grape tomatoes in hot 1-pint jars and leaving a ¼-inch headspace. Ladle the warm pickling liquid leaving a ¼-inch headspace, and be sure to add two cloves of garlic to each jar and one rosemary sprig. 4. Remove any air bubbles, and then place the two-piece lids and rings onto each jar. Process the jars in a boiling-water canner pot with 1 to 2 inches of water covering the tops of the jars for 10 minutes at 212° F with the canner lid on. 5. Turn off heat and remove lid from pot, allow the jars to sit in the hot water for 10 more minutes, then remove the jars and allow them to cool on a kitchen towel for 12 to 24 hours. 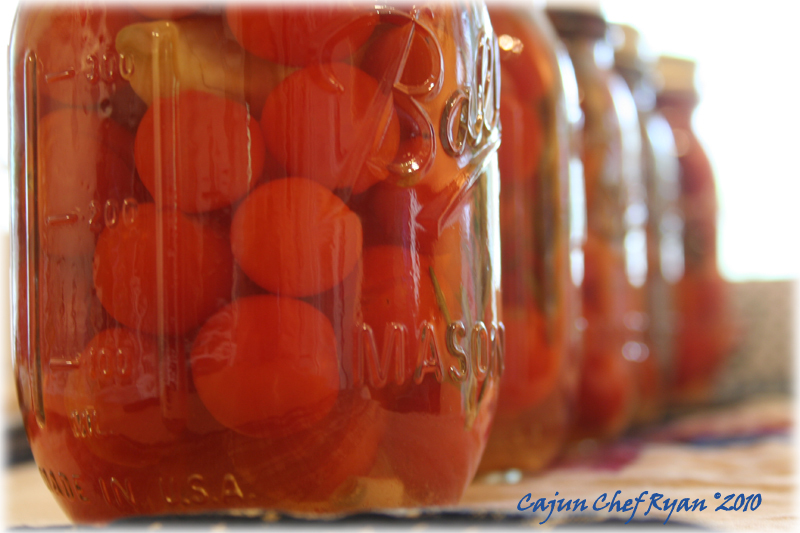 Label and date then store the jars of pickled grape tomatoes for up to 1 year. …new pickle cucumber salad, bread and butter pickles, fresh salsa, fire roasted tomato sauce, east meets west barbecue sauce, oh my! My last three posts have been about refrigerator pickles. With virtually no cooking, except to heat up vinegar and to melt sugar, I pickled shallot’s, radishes, scallions, red and yellow pickles, apples and onions. I only made one jar of each because I didn’t want to spend the day in the kitchen. I hope you’ll take a look those recipes and perhaps they’ll be inspiring. Your red tomatoes look the wishes. Divine…. loved the post…especially the memories about children collecting the figs. On to those little tomatoes. They look wonderful, beautiful photo as well. Those pickled tomatoes look great! They look so pretty together in the jars. I also enjoyed your story about the figs. I hope you post the pickle cucumber salad! Can’t wait for that! 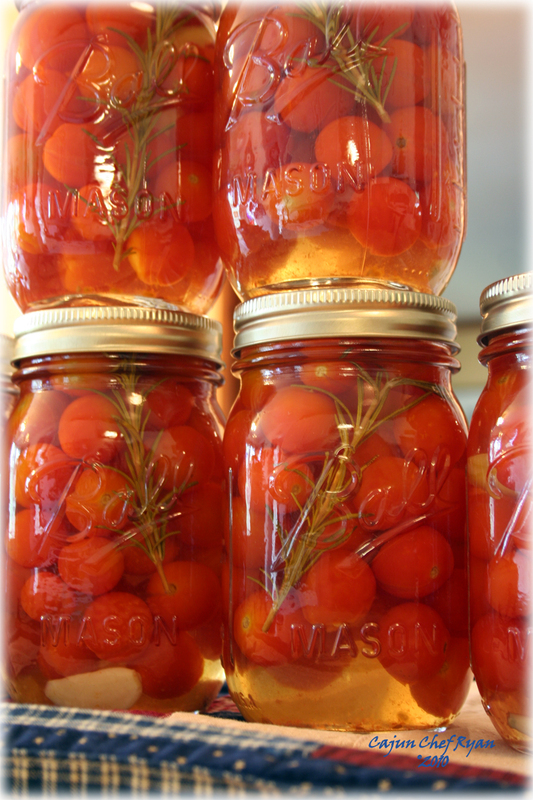 Awesome – I love canning and having a pantry full of goodies to eat and cook with. Thanks for the recipe….s….!! Great recipe I can just imagine the crunch here! I’ve never pickled red tomatoes, just the green ones. This looks wonderful though. I bet the addition of a hot pepper in the jar would be excellent. I don’t think I’ve ever had these but hey, send me a jar would ya? They are GORGEOUS! One of my goals this year is to learn how to can. I love anything pickled and your tomatoes might be just have to be my first interlude to the canning world. Thank you for sharing! These look delish! I have my first fig tree on my deck–I don’t know about it living through the winter here in St. Louis, but it is FULL of figs right now–not quite ripe yet. And I have been canning like crazy–pickles and spiced peaches so far. Can’t wait to see your recipes! Wow, those are gorgeous! We used to have a fig tree at our other house and I so miss it. The kids loved picking them, as did I. I loved eating them even more! Great pics. I’ve never tried canning before but this post sure peaked my interest in trying it for the first time. Wow! I never even thought of pickled tomatoes. This size tomato does not usually make it into my salsas but I am going to give this a try. Thanks. How fantastic to have access to all the beautiful produce! Had come across pickled tomatoes before, but I must say they sound delicious! Carol, I’ve been getting your email updates and will check out your recent pickling recipes soon. Megan, funny story about the children. One day they were helping me pick figs and my son dropped his bag of figs and accidentally stepped on some, and then he was so upset and started crying..”oh no…my figs…my figs!” It was one of those precious fleeting moments. Bamboo and Claudia, thank you so much! Drick, I hope to can some of the cucumbers this week, and may make a batch of the sauce soon too. Depends on timing though, we have company coming in town for three weeks, going to be entertaining, so…we will see! The Mom, we like to try new things in our recipes, and added spice is always fun! Gera and Mary, thank you so much! Lisa, with a pot large enough to hold the jars you can put up canned foods and preserves quite easily. Kelly, our fig trees withstood several light freezes each winter in New Orleans. You may want to just cover the tree with a sheet of plastic that is tied down in the winter and mulch the bottom of the trunk and roots with four to six inches to keep them from getting frozen. Your best bet would be to put it into the ground, potted plants are more exposed to the elements. Rachelle, I typically use Roma tomatoes for my salsas, these grape tomatoes are typically just eaten like popcorn, in salads, or as I have pickled them here for garnishes also. Penny, we doubled our garden this year and expect to double it again for a fall crop soon. Elin, you are very welcome, and thank you also! Wow…those are gorgeous. I definately must try this. I get tons of grape tomatoes from a farm stand in Immokolee. These would be perfect for an antipasto platter or just to eat. Jillyann, We love our grape tomatoes, and with four plants in our garden we are harvesting about 4 to 6 pints a day. They are wonderfully sweet! Jessie, With all the harvest I had to find a way to preserve them and sure enough the Ball book had a Grape Tomato recipe, I was heaven when I stumbled on it! Wow Chef what a great idea! We have lots & lots of the little critters and need some place to put them. Thank you also for your visit and kind comment on Jefferson’s Table! S. Stockwell, you are so welcome, always enjoy visiting your Table! And thank you too! Amanda, thank you so much! Christina, I would recommend that you get the Ball Blue Book, typically can be found at hardware or home improvement stores. It has all the basics you need for starting yourself in canning. There is nothing better than preserving the summer’s bounty in a jar! Not only are they pretty they are delicious in the winter. Can’t beat that. Love it! Love the photos! And the memories. Oh My! I wish my cupboard was filled with a few jars of these! I am still perfecting my canning abilities but will have to try pickled tomatoes someday! Beautiful photos! I am making the pickled grape tomoatoes this afternoon. What do you do with the 1 qt of water? I’m going to use it in the brine. Hope this is correct. Karen, yes, you are correct, the water should be added with the salt, and two vinegars. Going to update the recipe now. Thanks for the heads up on that mistake! This recipe is fabulous!! I canned them last year from the same book, but I used them as pizza sauce! Keep about a 1/3 of the liquic pour into pot with tomatoes and chop up the garlic and rosemary cooked down to a thick sauce, spread onto homemade pizza crust THEN add the fresh herbs or italian seasoning to taste …. All I can say is you will be hooked!! I am in the process of canning them again today, except I am going to use more garlic and sweet basil I have grown.. This is a no fail recipe!! Enjoy!!! I have a dozen pints of the grape tomatoes put up.I want to know how long should I wait before opening. I know pickles shold sit three to six weeks for flavor. I cant wait to try some! Great job! A dozen pints! I would wait at least a week or so, but you will notice as the more time you give them to rest, the better the flavor will develop. I still have some jars from a year ago that are well preserved.